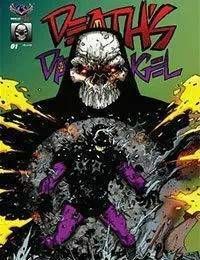 Its the 30th anniversary of Neil Vokes and Rich Rankins innovative black &amp; white comic Deaths Dark Angel! Originally published as Deaths Head by Crystal Comics, the story featured the deadly future echo of Eagle which evolved into a terrifying twisted version of the man he was. Now the silent killer has turned his sights on his past self and is set upon destroying those in the way of his singular mission. This edition has been fully remastered with an incredible ink wash finish that brings new life to the original story pages. And the Vokesverse continues to expand and gives us a first look at an all new Deaths Dark Angel story coming later this year! This is the ultimate introduction to the fertile imagination and characters of a comic book artistic legend!